I couldn’t actually care less about Easter. Seriously, it’s just some religious fest that’s somehow turned into Easter egg hunts and excessive chocolate consumption. Call me a cynic, but I just don’t see the point. 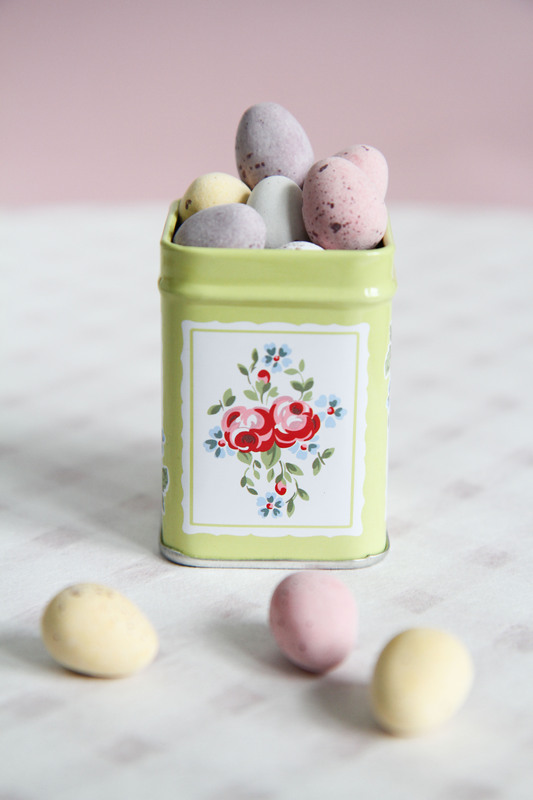 I really couldn’t care less about Easter – if it weren’t for the baking. Ok, ok, I admit it, any holiday that’s connected to some kind of traditional baking can’t be that bad in my books. So, Easter’s actually kind of alright! You see, in the UK they have these traditional hot cross buns that they eat for Easter. They’re basically little round sweet bread buns, made from a firm yeast dough. They’re flavoured with lots of cinnamon (yes!) and other delicious spices, and dotted with dried fruit. 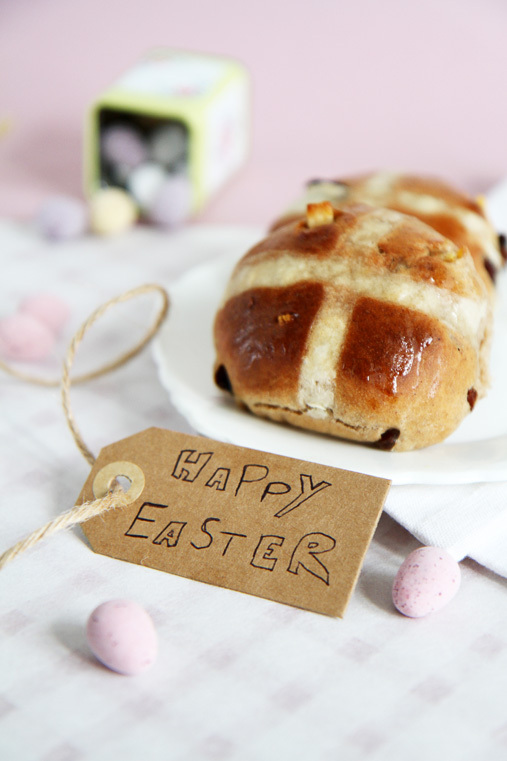 Traditionally, hot cross buns are eaten on Good Friday – the cross being the symbol for Christ’s crucification. 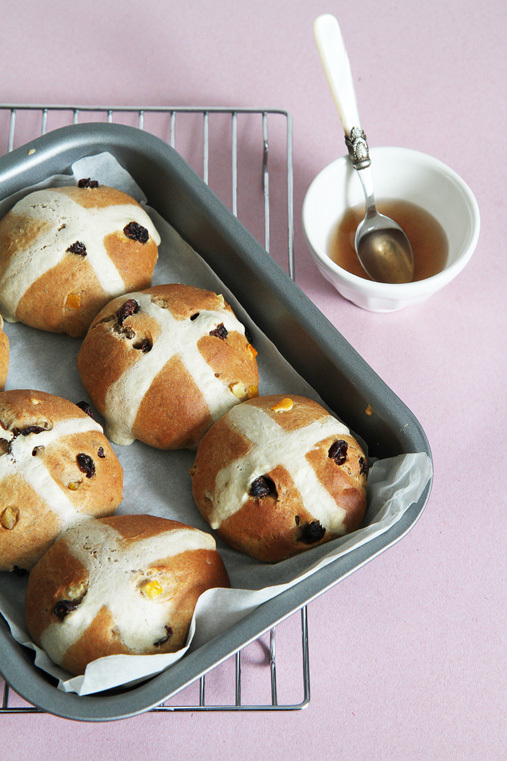 But these days you tend to get hot cross buns in supermarkets all year round – so they’ve kinda lost their magic a bit. Shame. 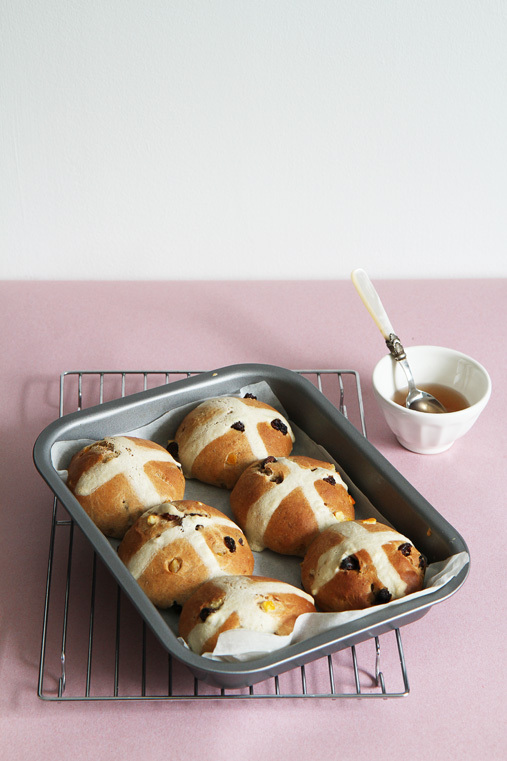 Still, even though you get hot cross buns all year round now, I’d never made them. Consider this: I’ve been in this country for nearly 9 whole years, and had never even attempted to make hot cross buns. Why? I just never really trusted myself to make a version good enough to get the stamp of approval from my British friends. I mean, living in this country and enjoying its culinary treats is ok, but telling people you can make such a classic treat and you suddenly have to compete with friends’ childhood memories of their gran’s perfect buns. A tough game to win! Then, this Easter I decided to throw all those hesitations to the side, pull up my sleeves and give it a go. And hey, they’re super easy to make! They’re basically like making bread or Christmas Stollen. You need to work the yeast dough, give it some elbow grease, then let the dough rest for an hour, work it again, let it rest again etc and then bake. So, a word of warning: these do take some time to make! But, they’re very easy and super yum. Expect a chewy bread texture, with bursts of dried fruit and strong spices. You should eat them while they’re still hot, but they’re actually just as good the next day when you toast them. Then spread a generous portion of butter on them, and maybe some jam, and enjoy! As for the ‘stamp of approval matter’, my neighbour, who happens to be very British, said he’d thoroughly enjoyed my hot cross buns. Now, if that’s not a proper thumbs up, then I don’t know what will do. So, on that note, a Happy Easter to everyone! Hope you get to do some baking over the long weekend! Dissolve 1 tsp of sugar in the lukewarm water, add the dried yeast. Stir and let the liquid rest for about 15 minutes, until it becomes frothy on the top. In a big bowl, mix all the bun ingredients (flour, salt, sugar spices, milk, egg and yeast mix) except the mixed peel and sultanas. Once you get a loose dough, start kneading with your hands (or with an electric mixer with the dough hook fitted on). Knead the dough thoroughly for 10 minutes. Then, knead in the dried fruit. Lightly oil a big bowl. Put the dough into the bowl, cover with a teatowel and let the dough rest in a warm place for 45 minutes, until the dough has doubled in size. Line a deep baking tray with baking paper. Tear off pieces of the risen dough and mold into balls. Place the buns into the baking tin, with a finger’s space between each of them. Cover the baking tin with a teatowl and let the buns double in size again for 50 minutes in a warm place. Meanwhile, make the white cross mix. Mix all the ingredients until you get a smooth batter. Pour into a piping bag, fitted with a 50mm nozzle. Preheat the oven to 190° degrees celsius. Once your buns have risen, pipe a cross on each of the buns. Bake the buns for 15-20 minutes, until nicely golden. Meanwhile, make the sugary bun wash: dissolve the sugar in the boiling water and add cinnamon. Once the buns are baked, take them out of the oven and brush with the sugary bun wash.
Eat immediately whilst still warm, or toast them the next day. I’m new to your blog, so happy I came across it on FoodBuzz. Your photos are stunning and blog so lovely! Looking forward to reading more from you.